Do you want to keep your baby essentials and products perfectly organized? Are you tired of going back and forth from one room to the other, in order to get everything you need? Are you looking for a stylish and convenient diaper caddy organizer for changing table? The MARI New York baby caddy organizer is everything you've been looking for! The nursery organizing basket is crafted to perfection with the best quality materials and special attention to detail for unique results and extreme durability. The diaper change organizer is made with soft felt and it is thicker than most you can find, at 4mm, so it can stay in perfect condition at all times! The diaper bag has an extra large capacity and spacious side pockets for diapering necessities to keep all your essentials in one handy place and acts. It also has a unique T-divider that is easily removable, so you can decide what compartments your diaper package has! Style matters and this is why we make sure that the nursery organizer looks simply incredible! Designed by the best New York designers, this nursery tote has an elegant and modern design, perfect for baby boys and baby girls! ✅ WITH BONUS POUCH: Because we want to help you stay perfectly organized, we give you for FREE a matching pouch for you to store small and valuable items, such as scissors, jewelry and more. The high quality pouch has a strong zipper for secure closure and it is crafted to perfection for unique durability. ✅ SUPERIOR QUALITY: The MARI New York nursery caddy is made with premium quality felt to ensure maximum durability and longevity. Our storage caddy is extra large and thick (15 x 10.5 x 7") so it can be perfectly sturdy and keep its shape no matter what, for your convenience. The diaper stacker also has handy dividers that are easily removable so you can decide what compartments the baby diaper caddy has. 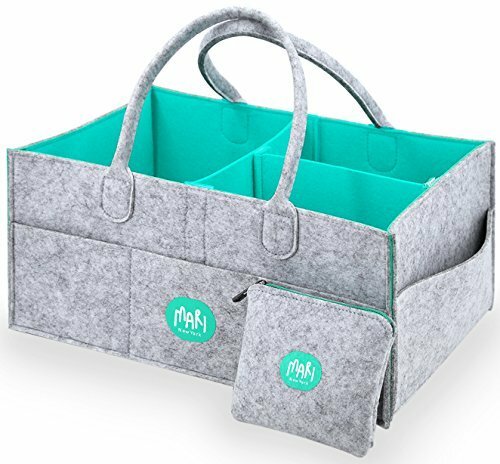 ✅ STUNNING DESIGN: The felt baby diaper caddy organizer has a modern and chic design that will look amazing in the nursery drawer, your living room, or your car. It comes in an elegant shade of grey and it is perfect for both baby boys and girls. This fashionable diaper organizer will make the great baby shower gift basket for all your friends - give it as a gift on its own or fill it with presents and baby supplies, and rest assured that every mommy-to-be will absolutely love it! If you have any questions about this product by MARI New York, contact us by completing and submitting the form below. If you are looking for a specif part number, please include it with your message.